The World lost one of its truly "Greatest" on the the 10th of Sivan -Dr. Irving Moskowitz Z'L. 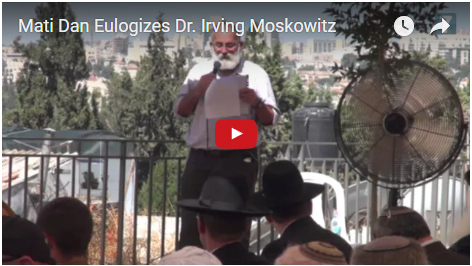 I had the honor and privilege of knowing Dr. Irving Moskowitz Z'L for the past 31 years. He and his beloved family transformed the Old City of Jerusalem, the Mount of Olives, Judea/Samaria, and all of Modern Day Israel. He and his family showed the Way. He was a Hero for Eternity. Every Jew should aspire to be Dr. Irving Moskowitz. He persevered, he endured, and brought Glory to Yerushalayim like no other. He was a devoutly Religious Man. He was involved in innumerable Projects throughout the Land of Israel. I went to the Golan Heights with him twice. He made sure to protect and defend every inch of the land of Israel with all his heart and soul. In 1990 he financed and directed a Jumbo Jet with 400 Yeshiva University students to Israel on the brink of the First Gulf War. The trip was called Operation Torah Shield. It made headlines in every corner of the world.I had the privilege of being part of that Historic Mission but it was all Dr. Moskowitz. There was a great fear at the time that Saddam Hussein would use SCUDS loaded with chemical weapons against Israel (Gas Masks were handed out to everyone in exchange for their passport). It did not stop the trip. It gave tremendous Chizuk (strengthening) to both Israel and America. American troops especially appreciated the trip since they were soon going to Battle. When we arrived in Israel we were greeted by every major network, every major Newspaper and every media outlet at the Airport. Dr. Moskowitz was a genius. He knew what he had to do and let nothing get in his way. In the summer of 1991 I went to Israel with Dr. Moskowitz Z'L along with Jack FriedlerZ'L, and Herb Zweibon Z'L and 100 American Leaders to fight for the 10 Billion Dollar Loan Guarantees to save Soviet Jewry that then President Bush was holding up. He eventually relented. The trip helped. Dr. Moskowitz Z'L was at the forefront of that fight along with so many others. I am only able to give a very small slice in the Life of Dr. Moskowitz. Books can and will be written about him. Dr. Moskowitz revolutionized the way one thought about Israel and the world. Along with Mati Dan HaKohen, the Founder of Ateret Cohanim, he was able to do what no one thought possible. He made it happen. I still remember reading his inspiring weekly column in the Jewish Press entitled, "One Minute to Midnight". This is indeed how he lived his Life. "If not now when?" Thanks to Dr. Moskowitz and his beloved wife, Cherna (Until 120), Jerusalem will remain UNDIVIDED forever. I remember on Operation Torah Shield that Dr. Moskowitz brought his Stethoscope. He had been a top flight Physician and loved Medicine and caring for People. He became a very successful Businessman after a brilliant Medical Career. He told me he always carried his stethoscope even though he was now involved in so many incredible projects. He was also a great Baseball Player in his younger days but chose a Career in Medicine instead. He would have made it to the Major Leagues. That is how good a ballplayer he was. In the late 1990's I accompanied Dr. Moskowitz to an area on the Mount of Olives called Ras-al-Amud. Dr. Moskowitz had purchased the land and was going to build a 120 Unit apartment complex there. He was running into all kinds of static. He got help from an unlikely source-then Prime Minister Ehud Barak. The day I was there protesters came too. It did not stop Dr. Moskowitz. he took it all in stride. Today the Ras-al-Amud Project is complete and is a bustling and vibrant area of Jewish Life. It is one of the many Projcts he was involved in. The renovation of the Ohel Yitzchak Synagogue in the Old Jewish Quarter, the Western Wall Tunnel Project, the Shepherd Hotel Project and so many others all due to the vision and courage of Dr. Irving Moskowitz, Z'L. The list goes on. He was a kind, gentle and brilliant Giant of a man. The World truly lost one of its Greatest. Dr. Moskowitz, Z'L should be a Special Advocate for all of us. The Family should be comforted among the mourners of Zion and Yerushalayim. A crown has fallen from our heads..... these words were said when the great Chassidic leader Menachem Mendl from Vitebsk passed away in Tiveria in 1788. And i say these words today, with the passing to the next world, of Dr.Irving Moskowitz. There are many Jews who know from where they came. They have history, heritage and roots, but they may not have a sense of the now - of the greatness of the hour for the Jewish People. Irving Moskowitz had both. He knew from where he came, and he knew, to where he was going. His felt the energy of the returning and emerging Jewish People in her homeland and he felt as one, with both the land, and her people. Wasn't just a nice concept for Irving. It was real, and part of his makeup. His unique blend of Jewish pride, emunah(faith), passion, drive, dedication, Chessed and huge generosity, made him stand alone on the highest Jewish pedestal in both Israel and abroad. He stood side by side, shoulder to shoulder, and heart to heart with Am Yisrael at every step, in this unfolding redemption process. From the time Irving Moskowitz walked the alleyways of the Old City with Mati Dan, nearly 40 years ago, till recently - when his soul-neshama departed to the Heavens, Irving Moskowitz had a "beautiful and pure love affair" with Jerusalem. With Jerusalem flowing thru his veins, Irving was part of the woven fabric of Jerusalem, feeling the pulse of the city, even from afar in both California and Florida. His body may have been generally in the exile, but his essence, his heart and his soul were all in Jerusalem. Libi BaMizrach (My Heart is in the East) wasn't just a phrase for Irving. His yearnings and dreams of Jewish life returning to Jerusalem were realized and actualized, by his own drive, committment and finances. Beyond his own personal Jerusalem home in Yemin Moshe, Irving z"l and Cherna (May she live in good health and happiness till 120) really had many homes. Beyond his own 8 wonderful children, Irving z"l and Cherna had many many children. Those homes and children were and are, the families and students living in the heart of Jerusalem. The hundreds of families of the Old City, the old Yemenite Village of Shiloach, Ir David, Maaleh HaZeitim, Shimon HaTzaddik, Kidmat Zion, Abu Tor, Beit Orot and the future families of Ganei Yitzchak, are all "hisfamilies and homes". Irving Moskowitz has redeemed and reclaimed Jerusalem for the Jewish People, and has thus ensured that a united Jerusalem stays in Jewish hands, for generations. He has been at the pioneering forefront of the unfolding realization of the redemption process and the Zionist dream in Jerusalem. A modest and humble man of peace, who believed that Jews had the natural, moral and historical right, to buy and live in any neighbourhood of Jerusalem, especially in an area, from where they were evicted. He also believed, that the only way to achieve basic peace and coexistence, with our Arab neighbours, was to show strength of conviction, and for Jews and Arabs to live together, under Jewish and Israeli sovereignty. He felt the pain of the Holocaust with many members of his own greater family perishing in Nazi Europe, and he knew first-hand, the concept of Judenrein. (Areas free of Jews). Irving Moskowitz was not going to allow that to happen in Jerusalem - where Jews should be barred or forbidden to buy and live in peace anywhere in Jerusalem. 'Judenrein' would not apply in united Jerusalem for Irving and Cherna Moskowitz. So, he purchased and purchased more, he built Jewish neighbourhoods, he added Jewish life to the Holy Basin and thus easily stepped into the enormous shoes of Rothschild and Montefiore. From his first "cheque" helping to purchase or redeem Yeshivat Chayei Olam (Today Yeshivat Bratslav Shuvu Banim), till the unfolding building project of the Shefer Hotel (Ganei Yitzchak) near Mt Scopus and the Shimon HaTzaddik neighbourhood, Irving z"l and Cherna have been involved in nearly every significant building project in many of the prime neighbourhoods in the Holy Basin or in the eastern sector of Jerusalem. in the Old City.......Yeshivot - Ateret Yerushalayim, Shuvu Banim, Beit Orot and the Mechina in Beit Zion and others......archeological digging in and around the Old City..…..Kotel Tunnels…. to neighbourhoods like Kidmat Zion and the old Yemenite Village of Shiloach and of course, the "Jewel in the crown" neighbourhood of Maaleh HaZeitim. The world would say "no" to Maaleh HaZeitim. The Arab League, UN, EU totally rejected and objected…..and even pressure from both US and Israeli authorities, would try to stop Moskowitz. ("Stop Moskowitz Now" was their official call).........BUT Hashem had His own road map, and Moskowitz together with Ateret Cohanim - was Hashem's partner. Maaleh HaZeitim was built and today, over 100 Jewish families live on the slopes of the Mount of Olives. On a very personal level, it is a tragic and sad day, primarily for Irving's wife Cherna, their eight children, 42 grandchildren and 12 great-grandchildren and the wider Moskowitz family. But on a national level, it is day of mixed, sad and proud emotions. On one hand, we mourn and are greatly saddened by Irving's passing from this world. Ateret Cohanim has lost a true friend, and a unique partner. Jerusalem has lost its pillar and builder. Am Yisrael has lost a unique idealistic individual with emunah (faith), who is referred to as "Boneh or Nasich Yerushalayim". (Builder and Prince of Jerusalem) But on the other hand, one can only be inspired, stand in pride and salute a giant, who has changed the face of Jerusalem and whose achievements for the Holy City, are second to none. We also know, that Cherna (May she live to 120yrs) and the Moskowitz family, who have totally supported Irving for all these years, will continue to walk proudly in Irving's footsteps. If the stones of Jerusalem could speak, they would say toda raba Dr. Moskowitz. They would speak of being dusty, dirty and lonely for 2000 years, until Irving z"l and Cherna came and walked the alleyways of Jerusalem. If the stones of Jerusalem could speak, they would say - we mourn for the Master Builder and Craftsman of Jerusalem. Thankyou Irving (Yitzchak Izak) from our hearts. Chazak U'Baruch and long life Cherna and the Moskowitz family. In conclusion - it will be said to the greiving Moskowitz family, throughout the 7 days of the Shiva - "המקום ינחם אתכם בתוך שאר אבלי ציון וירושלים" May you be comforted by HaMakom along with the other mourners of Zion and Yerushalayim. The standard understanding of this phrase, is that HaMakom - G-d, who is in every place, will give you comfort. Or, as was told to me, when my Aba z"l sadly passed away last year - the knowledge of his soul-neshama going to "The place" - HaMakom - Gan Eden - that too, will hopefully bring some comfort. I think that in Irving's case - we all have a third meaning of "The Place" –HaMakom, giving comfort. G-d will locate and show us. The place where He is felt, revered and feared. The foundation of the world since creation, and the centre or focal point of the Jewish world, since Abraham stood at Mt Moriah over 3800 years ago. The place that King David made into the eternal capital and thus united the People. That place is Jerusalem - HaMakom. And so - when we all look around anywhere in Jerusalem, we will see Irving Moskowitz z"l. The knowledge and sight of Irving's contributions and achievements in Jerusalem…..his redeeming and his building of the eternal united city - that too, should, or will give all of us, and hopefully the Moskowitz Family, alot of comfort. My "Jerusalem grandfather" now rests on Mt Olives overlooking "his" city. My "Jerusalem grandfather" whom i revered and respected, and who redeemed, built and secured Jerusalem for generations was Yitzchak Izak. Today, under a beautiful blue Jerusalem sky, i accompanied the "prince of Jerusalem", Yitzchak Izak ben Tzvi - Dr Irving Moskowitz z"l to the ancient Mount of Olives, so steeped in Jewish history, and heritage - where he was buried alongside many great Tzaddikim, Rabbis, communal leaders and pillars of the Jewish people. Yitzchak Izak-Irving is now resting and his soul-neshama is on its way back to the Heavenly source, ready to build the "Jerusalem of the Heavens". He was "right at home", on the Mount of Olives in the special honoured "prophets section" - for he, Irving Moskowitz z"l, was a pillar of Jerusalem and a true giant of this generation, impacting every sphere of Jewish life, the Jewish people and Eretz Yisrael, and inspiring tens of thousands of Jews in Israel and abroad. Overlooking the Temple Mount, the Old City, his "jewel in the crown" neighbourhood of Maaleh HaZeitim, and the whole Holy Basin, were now, all in front of Irving. The Levaya started with hespedim given at Yeshivat Beit Orot. They were followed by a very touching and emotional hesped by a family member Oren Ben Ezra, who spoke of his close bond and working relationship with Irving, and the loss of a "grandfather figure", a guide and inspiration. All speakers spoke of Irving's huge contribution to Jerusalem, his determination sometimes against the odds, his conviction, his honesty, modesty, and his love of Jerusalem, Am Yisrael and Eretz Yisrael. They spoke of his building projects and achievements, that can be seen throughout the city, and as many pointed out - Irving Moskowitz who has been the "Rothschild" of this generation, has helped redeem Jerusalem and has effectively brought Jewish life back to the heart of the city. In summary -they said that - Irving had an 'organic' relationship with Jerusalem, feeling the heartbeat and pulse of the eternal city, and in that spirit, he acted. A man of vision with deep rooted principles and ideals, he wasn't going to be swayed by politics, or even world pressure. He saw in front of him - a job, a mission and a dream that needed to be fulfilled......and so he made that dream come true. Irving Moskowitz believed that Jews had a natural right to live anywhere in Jerusalem, and this sentiment or belief, was even echoed and given an official "stamp of approval" by the mayor of Jerusalem. Although he wasn't able to attend, the Prime Minister Benjamin Netanyahu, sent a letter of condolence to the Moskowitz family and "praise" to a unique builder of Jerusalem, who was driven by his ideals and whose generosity and investments has helped secure a united Jerusalem. He also mentioned Irving's very supportive wife Cherna, who together with Irving have "moved mountains" and achieved greatness. 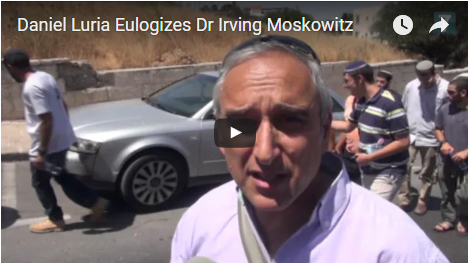 The Moskowitz family, close friends and representatives of a host of organizations supported by Irving, together with many admirers of his accomplishments (Over 650 people) walked from Yeshivat Beit Orot and the adjacent new Jewish neighbourhood, to the nearby Mount of Olives Cemetery. There was no shortage of police escorts, as the route has seen alot of Arab incitement and violence against Jews going to Mt Olives, over the years. But today, with Irving Moskowitz 'leading" the way in the Chevra Kadisha van, and the family singing Jerusalem songs loved by Irving, not one single Arab dared to stir trouble. In some ways it was very symbolic and maybe even a sign of fear and respect for the "prince, the builder and the man of Jerusalem". After Irving was laid to rest, his son Danny, representing his 7 siblings and the wider Moskowitz family, gave an all-encompassing, beautiful and emotional hesped-speech, about his loving, caring, passionate and idealistic father, who allowed each child to grow and move in any direction they chose. In addition to being a doting, giving and guiding light as a father - Danny spoke about his father, also being a man of deep faith and an exceptionally humble and modest father and person, who cared little for materialism. Yet his father was also powerful, idealistic, unwavering and very committed to Jerusalem, and to Jewish causes that were close to his heart. He accepted all types of Jews, and he had an open hand to all. Tehillim and Kaddish were said....and thus started the 7 days of mourning - the Shiva, for a special, unique and beautiful person, who had Jerusalem running thru his veins. Now my "Jerusalem grandfather" is resting. Few men in history have impacted the renewal of Jewish life in Jerusalem more indelibly than Irving Moskowitz. Few men in history have impacted the renewal of Jewish life in Jerusalem more indelibly than Irving Moskowitz, who died on Thursday at the age of 88. “The hundreds of families of the Old City, the old Yemenite village of Shiloach, Ir David, Ma’aleh Hazeitim, Shimon Hatzaddik, Kidmat Zion, Abu Tor, Beit Orot and the future families of Ganei Yitzchak are all ‘his families and homes,’” Executive Director of Ateret Cohanim Daniel Lauria said on Sunday. Moskowitz first became involved with the return of Jews to eastern Jerusalem 38 years ago, following an introduction to Ateret Cohanim’s founder Mati Dan by the philanthropist’s Los Angeles rabbi, Avraham Yeshayahu (Simon) Dolgin. “From his first check helping to purchase or redeem Yeshivat Chayei Olam (today Yeshivat Bratslav Shuvu Banim), to the unfolding building project of the Shefer Hotel (Ganei Yitzchak) near Mount Scopus and the Shimon Hatzaddik neighborhood, Irving and Cherna have been involved in nearly every significant building project in the eastern sectors of Jerusalem,” Lauria said. Indeed, after purchasing Yeshivat Bratslav Shuvu Banim nearly 40 years ago in the Old City’s Muslim Quarter, Lauria said Moskowitz’s involvement grew exponentially. His efforts were not without controversy. In 1996, Moskowitz’s ambitious project to open the Western Wall’s tunnels to tourists was met by Arab rioting following fallacious claims by Islamic groups that the true goal of the initiative was to take over the Temple Mount. Moskowitz also became involved in establishing Yeshiva Beit Orot, between Mount Scopus and the Mount of Olives, while concurrently spearheading controversial housing projects in the City of David and Silwan. According to Lauria, the driving force behind Moskowitz’s work was the loss of 120 family members during the Holocaust. “Because of the number of people that were lost in his family in Europe, I think that one of the things that drove him was he couldn’t handle the concept that Jews were not allowed to live in certain areas,” he said.